"At that time I didn't know that it would be as if it had not been at all … That's what life was like, so humiliating and ambivalent." 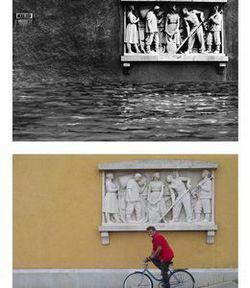 László 2 Hegedűs' exhibition The Great Flood in Fehérvár 2 is based on a series of black and white photographs, supplemented with a visually updated color version, film and installation. Péter Esterházy's text, written for the pictures, undergoes a transformation as part of the light and sound installation. The motion picture, a fictive documentary version of the theme, blends real and unreal images of an imaginary flood in interpreting the pre-regime-change photos. The ESSL AWARD CEE 2009 is dedicated to the discovery and support of young creative talents in Croatia, the Czech Republic, Hungary, Romania, Slovenia and Slovakia. The ESSL AWARD CEE 2009 aims to support artists who are still in training. In November 2008, the Open Society Institute and OSA Archivum announced an online photography contest entitled Chachipe Youth.